Hughes Garage 1940 - Auxillary Fire Service (situated behind). The late Jim Strudwick`s A F S uniform badge with christmas card and press cutting. 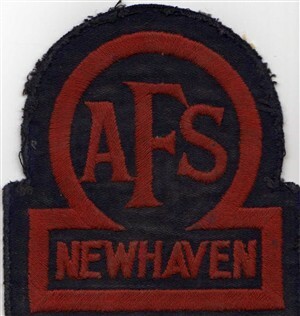 My Dad, Frank Gilbert, was also in the AFS at Newhaven in the early years of the war. He was on duty one evening at the North Quay when cries were heard coming from the river. Dad jumped in and pulled a young soldier to safety. He was awarded the Royal Humane Society's Bronze medal for this. He didn't stay in the AFS throughout the war. 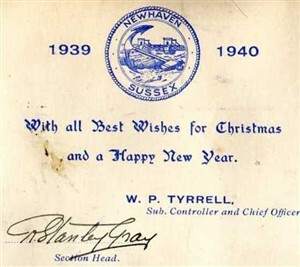 As a Merchant Navy officer, he went back to sea and spent most of the war in coastal tankers ferrying aviation fuel for the RAF. Does anyone know of any photos of the AFS at the time that might show him?